11/28/2017 // Sharyn Reinhold, M.S. Navigating a gluten-free diet can be tricky, especially for those who are just getting started. However, a well-executed gluten-free diet is crucial for those who need to do so in order to improve their health. Some key factors in helping your patients maintain a long-term and successful gluten-free diet include: meal-planning resources, education on appropriate foods, and an “emergency” plan for accidental exposure. Accidental exposure from hidden sources or through cross-contamination can stand in the way of desired health outcomes and can also sabotage accurate assessment of progress. canned soups, baked beans, etc. Unfortunately, hidden sources of gluten can include non-food items as well. A few examples are lipsticks, medications, toothpaste, and playdough. Personal care products, paints, envelopes, and pet food may also contain gluten. While these items are not directly ingested, they could be transferred from the hands to mouth inadvertently. Give them resources such as recipe ideas and print-outs on gluten-containing foods, safe foods, hidden sources, avoiding cross-contamination, etc. Practice empathy – if you personally have been following a gluten-free diet for some time, it can be easy to forget how overwhelming it can be at the beginning. Early success is important, because the positive improvements in health will speak for themselves and subsequently cement an individual’s motivation and long-term compliance. Although it can be a hard transition, there are many great resources currently available on gluten-free diets for both patients and practitioners. Encountering gluten accidentally can be both physically and mentally detrimental to the sensitive individual. Gluten enzyme supplements are a novel solution to this dreadful roadblock. * Following these tips will not only help with a smooth transition to a gluten-free diet, but will also help set individuals up for long-term success on their gluten-free lifestyle. 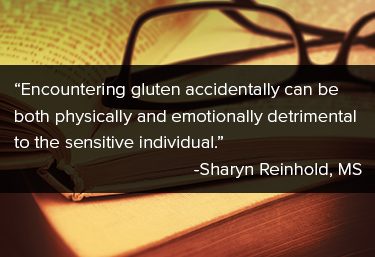 Sharyn Reinhold holds a Bachelor's degree in Psychology and a Master's degree in Applied Clinical Nutrition, with a special interest in the gut/brain connection and other behavioral nutrition concepts. Sharyn became passionate about nutrition after her own battle with chronic Lyme disease and seeks to help others combat pain and inflammation through diet and lifestyle changes, from a functional perspective. Hlywiak K. Hidden Sources of Gluten. Practical Gastroenterology. 2008 Sept. Celiac Disease: A Comprehensive Review and Update, Series #2: 27-39. Vici, G, et al. Gluten-free diet and nutrient deficiencies: A review. Clin Nutr. 2016; 35:1236-41. Salden BN, et al. Randomised clinical study: Aspergillus niger-derived enzyme digests gluten in the stomach of healthy volunteers. Aliment Pharmacol Ther. 2015 Aug; 42(3): 273-85.